The amendment was prepared by the City of Melbourne and will recognise the Palace Theatre as a place of local heritage significance. You have until Friday 20th March to make a submission to the City of Melbourne on amendment C241. We encourage people to make a submission, it can be straightforward and simply state your support of the amendment. These submissions are important and ‘weight of numbers’ can certainly make an impact. Melbourne Heritage Action strongly endorses the proposed amendment C241 as recognition in the planning scheme of the social, historical and architectural value of the Palace Theatre to the people of Melbourne. We have long argued that this heritage place has additional significance beyond the contextual considerations of the site as a part of the Bourke Hill Heritage Overlay (HO500), and is rightly deserving of listing as a building of heritage importance in its own right. In addition to our broad support for the proposed amendment, we also claim that the remaining historic interiors, including remnant decorative features and important plan, elevation and structural details, are valuable heritage features of the building likewise deserving of specific interior controls, which should in due course be considered as part of an additional amendment directed toward their recognition in the planning scheme. While superficial damage to the interior, including certain decorative elements, plasterwork, tiling and joinery has recently occurred at the discretion of the building’s owner, we assert that, while it is regrettable that some original heritage fabric has been lost, such damage could, at a future time, be remediated whilst retaining the integrity of the key socio-historic and architecturally significant aspects of the site. It has been noted in past heritage reports regarding the interior of the Palace Theatre, that certain changes and alterations have occurred over a series of renovations in the building’s long history. However, at no time has it been suggested, either by heritage experts or others, that such changes have completely eliminated the heritage significance of the place. Indeed, we would argue that with each change, a new layer of historical significance has accrued, and that contrary to other cases of alteration and ad hoc adaptation of historic structures, the heritage significance of the Palace Theatre has remained intact as a result of its extraordinarily long and continuous use as a theatre and place of popular public entertainment in Melbourne. In this way, the building represents something quite remarkable in terms of the depth of its historical associations and meanings, and the longitudinally unified quality of those meanings. 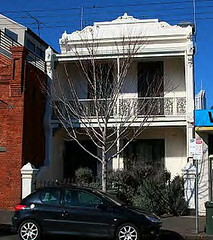 Few, if any, historic sites in Melbourne can tell the tale of the development and evolution of live entertainment in a specifically Melbourne context, and the coming of new forms of public entertainment, such as cinema and amplified live music, in the way that the Palace Theatre can, making it a unique touchstone of cultural and civic meaning for the city and its people. For all these reasons, we applaud the City of Melbourne for recognizing in this amendment the significance of the whole of the built form of the Palace Theatre, including the original Edwardian Hotel fabric and the intact prominent three-level (gable ended) brick building with pitched originally corrugated iron clad roof. Intact red brick heritage buildings with their original features expressed in three dimensions in the streetscape and laneways of Melbourne are becoming increasingly scarce, and the Palace Theatre now falls into this league of materially and symbolically recognisable heritage places that remain eminently ‘readable’ within the eclectic architectural ‘scene’ of Melbourne, in terms of both their historic uses and civic and cultural meanings. As part of this important intact historic built form and fabric, we would also encourage the City of Melbourne to reconsider the importance of the building’s interior – which remains structurally integral and fully adaptable for yet another iteration of the Palace Theatre as a place of public entertainment. We submit that the next addition to the rich palimpsest of history that the Palace embodies, will only add to the importance of the place in Melbourne’s culture, as demonstrated by the recent and very broad community support for the ‘Save the Palace Theatre’ campaign. It follows, then, that the key elements of the historic interior that remain, should be protected with interior controls, in order to maintain the continuation of heritage associations dating back to at least 1912, as already alluded to. These remaining heritage interior elements include: the 1916 auditorium form and the two 1916 galleries with supporting ornamental cast iron columns. The Adamesque Louis 16th style ceiling dome and remnant wall and ceiling panelling (now incomplete, but with salvaged sections available to enable future restoration works), and the 1916 main marble stairs, as adapted in 1952; the 1916 and 1923 dress circle foyer decoration including the coffered ceiling, wall panelling and mouldings (now incomplete), and the leaded glass windows to Bourke Street, as well as the Upper Circle foyer 1940 form, plaster ceiling and wall ornament, with stair from the Dress Circle; and the 1912 staircase from Bourke Street to the upper gallery level on the east of the building with treads of white marble. A further amendment to the local planning scheme would see these and other significant interior elements protected as recognition of the part they have played in underpinning one of Melbourne’s oldest and best known places of public entertainment. The protection of this building undoubtedly represents a civic good that goes far beyond the plans and aspirations of the current owner, and elevates its status in the planning scheme to something more in line with the heritage and cultural values already accorded to it by the broader community, as evidenced by the long and popular ‘Save the Palace Campaign’, including the voices represented in the 25,000 signatures gathered in support of heritage protection of the Palace Theatre, and the likewise passionately supported work of Melbourne Heritage Action in advocating for the building’s ongoing role in the cultural life of Melbourne. There is one point of clarification that the Amendment should address. The area covered by the proposed HO includes the eastern bay of the Victorian building next door (no 32 Bourke Street), which has been on the title since the original construction of the theatre in 1912. This was purchased in order to provide fire escape routes through the right of way created through the ground level, while the upper levels provided accommodation described initially as a hotel, and later perhaps housed guest performers, and then, until its recent closure, offices for the theatre. The statement of significance does not address this portion of the building, except the phrase “remnant Edwardian-era hotel fabric” in the first line of the ‘what is significant’ section, which presumably refers to 32 Bourke Street. We suggest that either the area covered by the HO be modified to exclude 32 Bourke Street, or that its inclusion is made clear in the Statement of Significance. 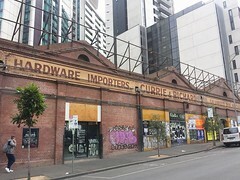 For instance an additional line in the ‘what is significant’ such as “Fabric of three level Victorian brick building adjacent at 32 Bourke Street, which is incorporated into the title and historic use of the theatre proper”.